While setting up for our first day of camp last week, I found a printed copy of this article tucked away in a drawer in the school cafeteria. 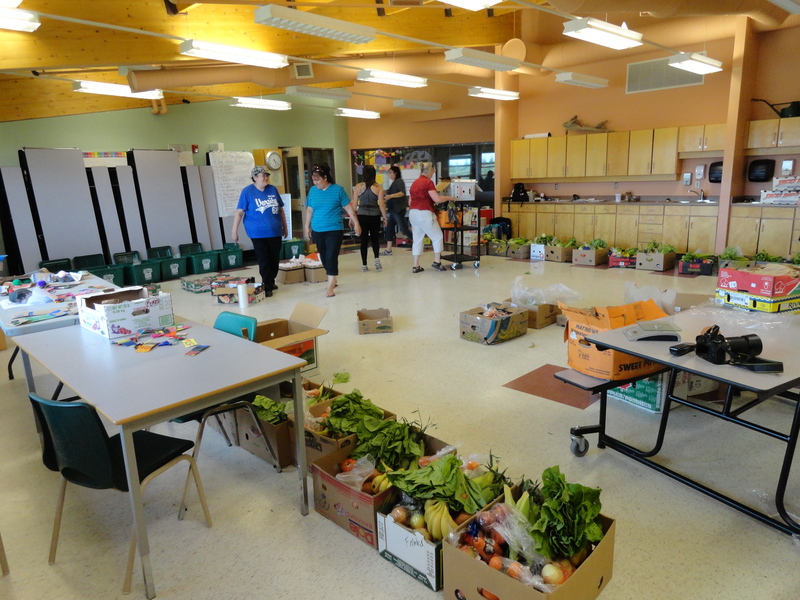 Having only just arrived here at the time and having quite a few questions about the cost of food after my first trip to the Northern Store, I was quite excited to learn about the farmers’ markets that take place regularly in Fort Albany. I was also very intrigued by the work that community members are doing to make healthy produce accessible to people living here. Today we volunteered with the farmers’ market and had a chance to witness this extraordinary undertaking in action. We stayed after camp to help fill food boxes for those who had pre-ordered them. A $50.00 box contained 1 bag of carrots, 1 red pepper, 1 green pepper, 2 large tomatoes, 4 ears of corn, 1 head of lettuce, 1 bag of onions, 1 bag of apples, 1 bag of sweet potatoes, 8 bananas, 2 packages of blueberries, 2 bags of clementines, 3 peaches, 3 nectarines, 4 apricots, and 1 package of strawberries. Even as we were filling the boxes, calls continued to come in from people hoping that a box might be available at the last-minute. 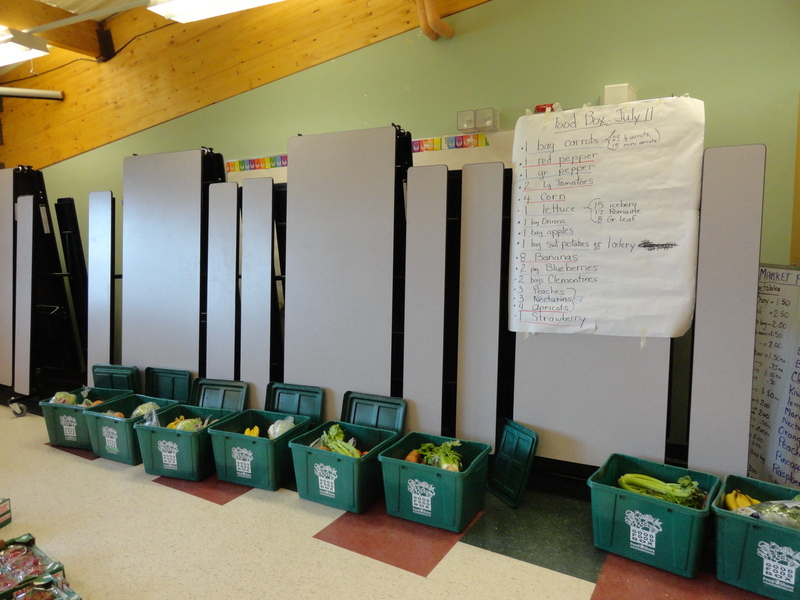 After filling the boxes, we took the remaining fruits and vegetables outside to set up the market. There were people waiting outside of the school as early as half an hour before the scheduled start time. When it was finally announced that the market was open, people immediately began running towards the food. During the market, I helped to run one of the checkout stations. As people unloaded large boxes of fruits and vegetables for us to count, so many commented about just how much cheaper this food was than what is available at the Northern Store. One striking example of this was corn. At the Northern Store, two ears of corn normally cost over $5.00, but the same (and likely higher quality) produce could be purchased for just $1.00 at the farmers’ market. I have been trying to read more about food accessibility in Northern communities and recently came across the video below posted on the FoodShare website. It goes into much more detail about just how much effort goes into making these markets possible and how important they are to the community. Between what I have seen living here in Fort Albany over the past few weeks and what I have learned through conversations with community members, I can’t help but feel angered by the denial of fresh and affordable produce to individuals living in remote Northern communities. It is wonderful to see people here addressing the issue directly and refusing to simply accept the prices of produce at the Northern Store. At the same time, I cannot help but wrestle with the question of what needs to change on a broader and systemic level to make access to healthy and affordable produce a reality in remote communities. I will save additional thoughts on that topic for another day, but I certainly believe that we can do much better. In the meantime, I am looking forward to helping with a few more farmers’ markets in the coming weeks and spending time getting to know the wonderful people who are so committed to making them happen. 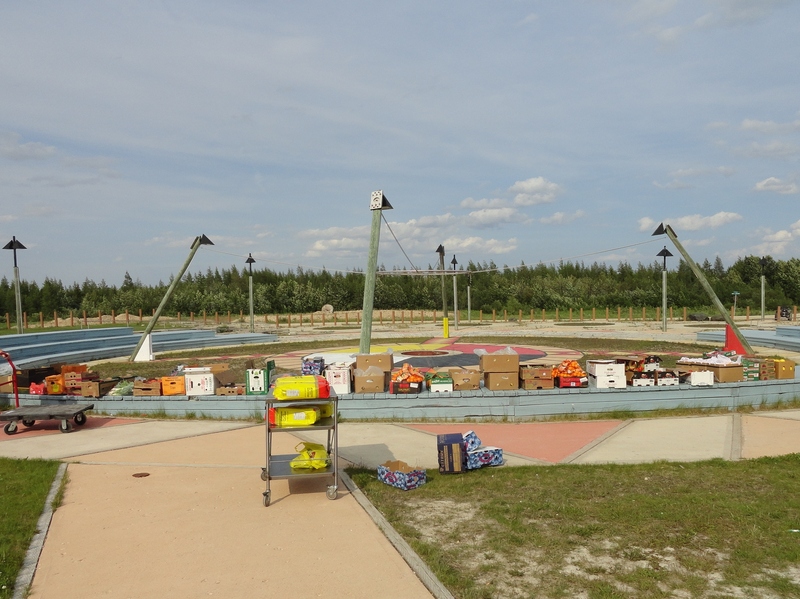 This entry was posted in Fort Albany and tagged First Nations, Food, FoodShare, Fort Albany, Frontier College, Lieutenant Governor's Aboriginal Summer Reading Camp, Northern Ontario on July 11, 2014 by nicoledalessandro.